The Moravian Lives project has been making terrific headway over the first half of 2018. 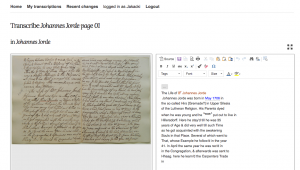 This ambitious project, led by Katie Faull (German, Comparative & Digital Humanities), involves collaborators in Germany and Sweden, members of L&IT, and a number of students engaged in DH research and dynamic forms of publication. 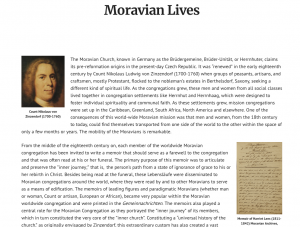 Moravian Lives is a scholarly research project and digital collaborative publishing platform that currently is focused on the memoirs of some 60,000 people from around the world, from the early 18th century to the present. The Moravians (a German Protestant religious group) required the written relation of each member’s life. And this archival record provides today’s scholars in multiple fields in the humanities and social sciences with rare opportunities to understand how people from the 18th century to the present from all over the world thought and wrote about their lives. Katie Faull, working with members of Bucknell L&IT including Diane Jakacki, Don Spidell, Dan Mancusi, and Mike Dahlberg, is collaborating with partners at top research institutions in Germany and Sweden, on a long term project that entails ground-breaking work in the Digital Humanities. The platform includes customized open-source tools and methods for image digitization, text encoding hosted at Bucknell, as well as mapping, and network analysis applications hosted at the University of Gothenburg in Sweden; it is designed to involve a large number of collaborators working with English and German texts. The newest development in this research relationship involves the discussion and development of a rich multifaceted visualization platform that enables scholars to delve into the lives of these remarkable people. Using a range of data visualization tools and linked data infrastructure, users will be able to consider the complex social and knowledge networks of the Moravians across space and through time, thereby revealing intricate connections among people crossing gender, race and ethnicity over the past 300 years. Both current Bucknell students and alumni are working together with their peers in Europe to transcribe, encode, link, and publish these documents. Faull has already set up an exchange for Bucknell students with a knowledge of German and text encoding to work on facets of the project at both the University of Gothenburg and the Johannes Gutenberg University in Mainz. A doctoral student from Mainz will be coming to Bucknell this fall to learn “the Bucknell DH method” and also carry out research at the Moravian Archives in Bethlehem, PA. Further cutting edge platform development is planned this fall at the Academy of Sciences and Literature in Mainz where one of the Bucknell team, Michael McGuire ‘07, will also be teaching a module of the DH summer school, focusing on the Bucknell “Moravian Lives” project. The Moravian Lives project emerged from Faull’s long-term research and scholarly publication portfolio on Moravians in Colonial Pennsylvania. This work also intersects with her involvement with the Stories of the Susquehanna Valley project and the Coal Region Working Group. Financial support for the project has come (on the US side) from L&IT and the President’s Office. Grant proposals to the National Endowment for the Humanities’ Office of Digital Humanities are pending. Moravian Lives research collaborators include the Moravian Archives in Bethlehem, PA, the Unity Archives in Herrnhut, Germany, the Moravian Archives in London and Fulneck, U.K., the Johannes Gutenberg University in Mainz, Germany, the Academy of Sciences and Literature in Mainz, the University of Gothenburg in Sweden. Students working on the project include Carly Masonheimer ‘21, Marleina Cohen ‘21, and Bucknell graduates Khoi Le ‘18 and Michael McGuire ‘07.